We're geeks. You all know that. But there are times when the reality of it hits me. Like tonight, when we're having dinner and the boys are discussing binary clocks and some kind of 16 code. I think this is what they were talking about, but I'm not sure. Looking across at Oatmeal Head, his t-shirt read, Friends Don't Let Friends Have Mullets. Yesterday's said Donut Whisperer. Goof Ball has one which reads, AD/HD and looks like an AC/DC shirt. 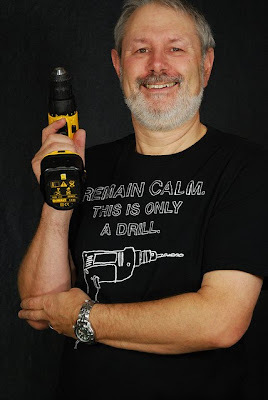 My own favorite is my shirt with the outline of a drill and it says, Remain Calm. This Is Only a Drill. Just like this guy's shirt, but it looks better on me. Just sayin'. What really hit home, though, was realizing that the kids are third generation geek. My mom, Grandma, was over one afternoon when Goof Ball wore his shirt which says 11Cheers for Binary! Grandma asked, "Shouldn't that read two cheers for binary?" I love my geek family. One of my most favorite tees that my husband wears is "Trust me I'm a Dentist" and it makes me laugh. I think I'm having geeky family withdrawls! We need to take a trip to Tulsa! Hooray for geeks! I have 4 adult children geeks but my poor farmer, not so much. Geeks are great! If not for geeks, where would the world be? Speaking of geeks - have you seen the magazine, Mental Floss? Geek heaven! LMAO you have some classic clothing, I love the ADHD one! Binary? Know the word but clueless. You are blessed to have geeks. They rule the world ya know? The cutest geek family ever! Tagged you in a Meme - go check it out! !